This page may contain compensated links. Please see our disclaimer at the end of this page for further info. We’re big fans of our Trunki boostapaks, which are backpacks that double as carseats. 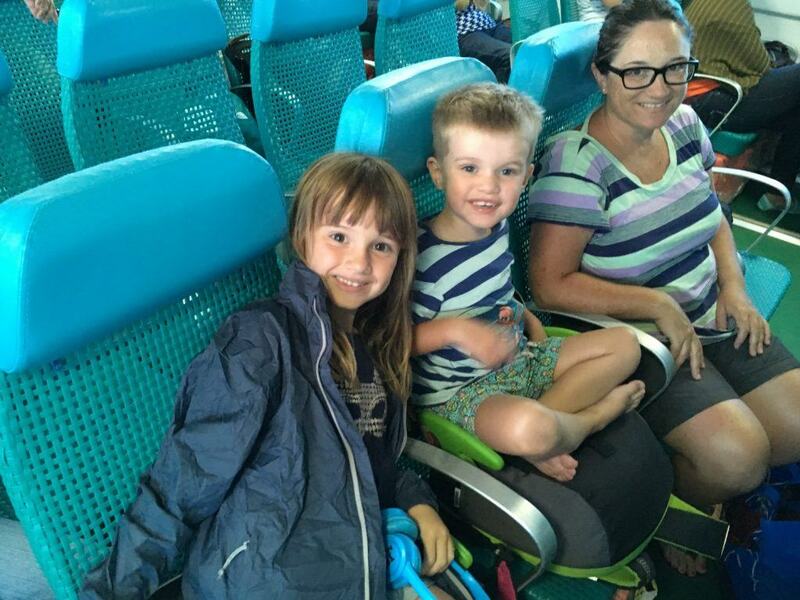 The kids carry all of their toys around in the 8 litre capacity backpack and it’s hand luggage approved for flights. They quickly convert into an ECE/US approved carseat, with a hard shell to protect the inside contents. We’ve also used them on ferries, buses and in restaurants to boost the kids up a bit and give them a better view! The Bubblebum Inflatable Travel booster seat is another great option if you already have a child backpack. See Portable Carseats and check prices online here. Our Tula toddler carrier helps us out on many occasions, when the kids get too tired to walk. We have the toddler sized version which is perfect for our 4 year old. However our 20kg 6 year old has been known to climb in from time to time! 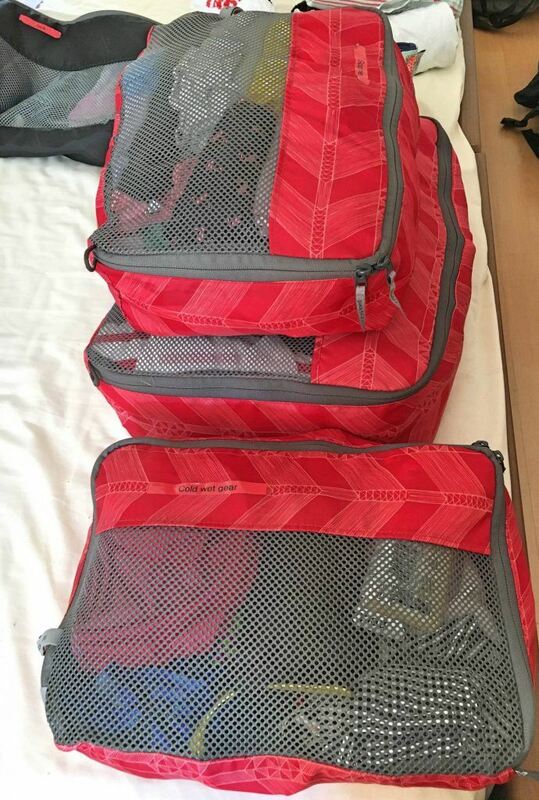 The carrier also folds down to a very small size, so it doesn’t take up much luggage space. Space is at a premium for us as. We pack as efficiently and lightly for our travels as possible. We use packing cubes, which brilliantly help compartmentalise all of your items into individual packs. Each of us fits our clothes into one packing cube. We also have one for our swimwear, cold weather gear and all our electronic cables. We wouldn’t be without our packing cubes! They’re extremely handy for overnight stops as well. We can just pull out the packing cubes instead of rummaging through the suitcase and messing everything up, leading to a total repack! Check out prices for Packing Cubes and buy online here. We agonised long and hard about giving our kids tablets. They love screen time and the last thing we wanted to do was have them sitting all day on them! 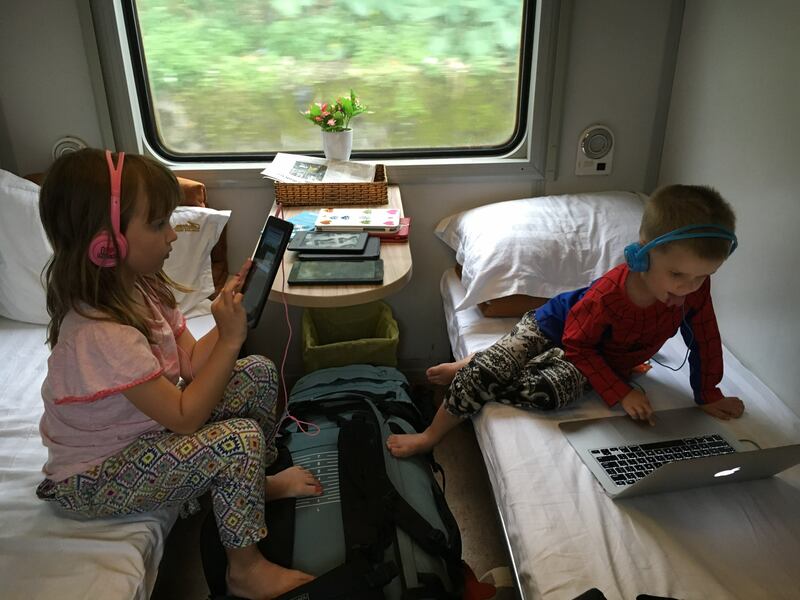 But we decided they were an essential for homeschooling on the road, given the amazing number of educational apps that are available. 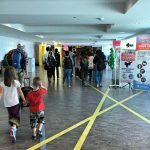 We ended up having a rule of unlimited screentime on travel days, which saved both our sanity and that of our fellow passengers. We were often complimented on how well behaved our children were! We purchased them an Amazon Fire tablet each, which we got for a bargain price in the Black Friday sale. They’ve been great for educational purposes, and also for travel days on budget airlines, where there is no inflight entertainment. They’re lightweight and robust given the hard life that they have. See the range of Amazon Fire tablets here. Unfortunately our 6 year old daughter gets quite badly carsick and we’ve found a couple of natural products which really help her. We use Gin Gins candies on road trips. The Gin Gins contain ginger to help with nausea, and she loves the taste. They have all natural ingredients. Learn more about Gin Gins here. We also give her Sea Bands to wear, which are acupressure wristbands that can be used by children aged 3 years and up. The Gin Gins/Sea Bands ritual is something we do before each long car journey. A torch is a great item to travel with, especially when you’re travelling through SE Asia which often has sporadic power cuts. Street lighting at night can also be a bit hit and miss and the kids love nothing more than navigating their way home with a torch. Check out this ideal travel torch and view prices here. Our kids love a good game of UNO, and even our youngest got into the spirit of it. He could play (and win!) when he was 3 years old. 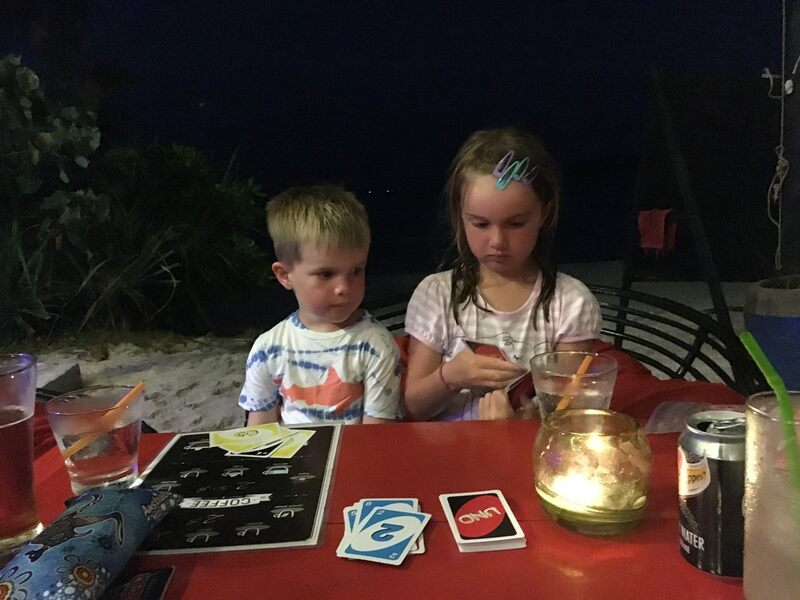 We’ve had UNO marathons on deserted Cambodian beaches, at 30,000 feet on a flight to the Philippines, and cruising on a boat in Vietnam. We’re also big fans of magnetic snakes and ladders and Hangman. These games are also great for ice-breakers with other kids. 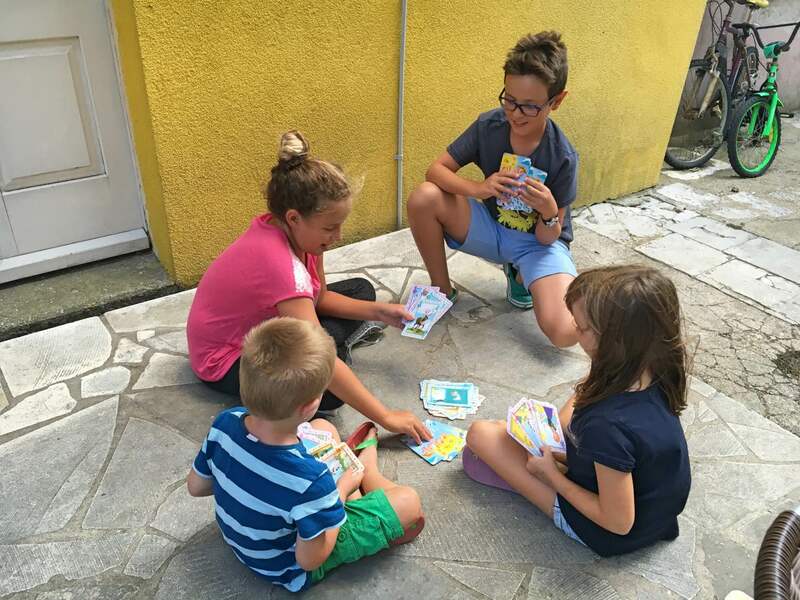 Here’s a picture of the kids playing with our neighbours in Croatia – they spoke very limited English and our Hvartska is non-existent but cards was a universal language for them all. 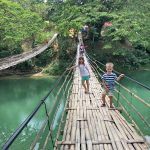 We travel to countries that have a risk of malaria, dengue fever, Japanese encephalitis and other mosquito-borne diseases, and we don’t want to take chances with protection. In addition to a good mosquito repellant, our latest find that we’ve found really useful are mosquito patches. They contain citronella oil, are FDA approved and stick directly onto clothes. Our kids loved wearing some that we found in the Philippines because they were princess and superhero designs! View anti-mosquito patches and buy here. There are a host of different travel apps out there, but the one we use the most often is TripIt. This clever app allows us to load all of our itinerary details including flights, hotels, tours and transportation details into one place. It saves us a lot of space in carrying around printed out copies of itineraries and tickets. If you upgrade to the premium version it even gives you real-time details about flight delays. Because we generally travel to mostly sun-kissed places, and come from a country with one of the world’s highest melanoma cancer rates, we’re careful about how much sun exposure we get. 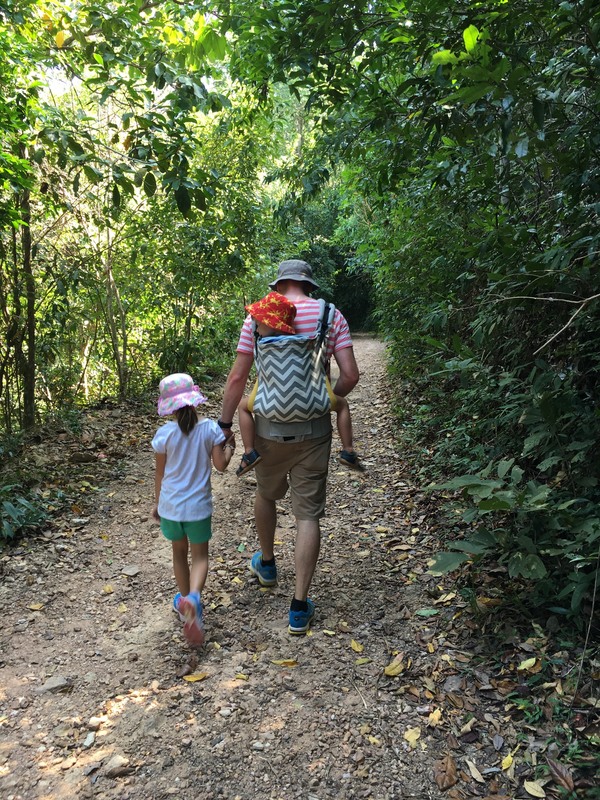 Sunscreen is very expensive in Asia and we’re not fans of putting chemicals all over our kids day after day, so we try and minimise the amount that we need. 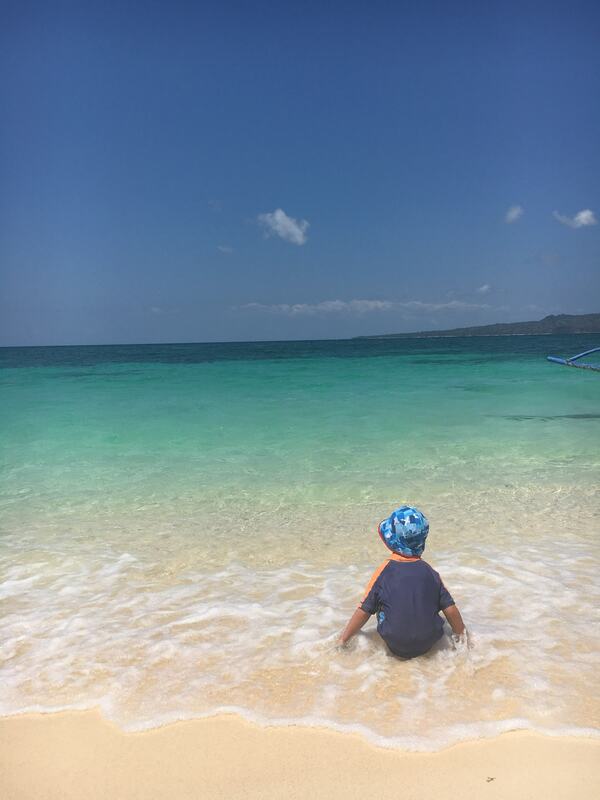 Swim shirts (or rash shirts/rashies as we call them in Southern Hemisphere) are a great way to protect little kids’ skin from the harsh rays. Combine with a good wide-brimmed waterproof hat and you’re good to hit the beach or pool. Check out this great swim shirt and view prices here. **Note: Our Overseas Adventures is a participant in the Amazon Services LLC Associates Program, an affiliate advertising program designed to provide a means for sites to earn advertising fees by advertising and linking to amazon.com, amazon.co.uk, amazon.ca. Amazon and the Amazon logo are trademarks of Amazon.com, Inc. or its affiliates.